UNIVERSITY PARK – Senior Brad Pataky of Clearfield was one of two recipients of ‘True Grit’ Award from the Nittany Lion Club at the 24th annual Penn State Student Athlete Advisory Board (SAAB) Athletic Achievements Awards Banquet held in conjunction with National Student-Athlete Day earlier this month. According to a release on the Penn State wrestling website, the award is given each year to the student-athlete(s) who overcome the most in terms of personal or physical obstacles to have success, either individually or in leading a team to success. Pataky and junior gymnast Whitney Bencsko of Pompton Plains, N.J., were honored for their perseverance and dedication in battling back from serious knee injuries to continue their careers during 2010-2011. Pataky was sidelined for the first month of the season and again in January before rejoining the lineup for a second time at the end of the regular season and then being rewarded with a third appearance in the NCAA Division I Championships. Going into the season, four publications or web sites had Pataky ranked among the nation’s top 10 125-pounders. He wrestled in only six dual meets and finished with a 12-7 record. For his career, Pataky was 48-12 in dual meets, registering 195 dual meet points for the Nittany Lions, and 86-36 overall with 13 falls and 19 technical falls. Pataky also was recognized along with his teammates, the Big 10 Conference and NCAA champions, for earning the “large team” SAAB CHAMPS Cup for community outreach. The Nittany Lion matmen completed more hours of community service than any of Penn State’s 29 varsity teams. The “small team” award, for squads with 20 or fewer members, went to the Lady Lion gymnasts. Penn State student-athletes racked up approximately 3,300 hours of community service. In all, almost 300 awards were presented to 237 Penn State student-athletes. 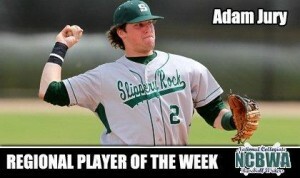 SLIPPERY ROCK – The big weekend Slippery Rock senior Adam Jury of Bigler had against Indiana April 15-17 resulted in the Clearfield Area High School graduate being named National Collegiate Baseball Writers Association NCAA Division II Atlantic Regional “Hitter of the Week” last Wednesday. Jury was cited for hitting .438 with three home runs, one double and 10 runs batted in as The Rock won three of four games from the Crimson Hawks to maintain its grip on first place in the Pennsylvania State Athletic Conference Western Division. His slugging percentage was 1.063 for the two double-headers. Earlier last week, Jury was accorded PSAC-West “Player of the Week” honors for the 7-for-16 weekend. He was hitless in eight official at-bats but walked six times last week as The Rock split a twinbill at Shippensburg (3-6, 15-11) Monday and swept division foe Lock Haven (5-0, 3-0) Saturday. Slippery Rock (25-13) entered this week 13-5 in the PSAC-West and 1-1/2 games ahead of Mercyhurst. The Rock is ranked No. 5 in the NCAA D-II Atlantic Regional poll and received votes in last week’s American Baseball Coaches Association national poll. Jury, whose batting average is .278, has 37 RBIs and shares the PSAC lead with Kutztown’s Shayne Houck. He’s second on the team in hits (37) and tied for the lead in home runs (5). In the field, Jury has participated in a team-high 20 double plays that rank No. 3 in the PSAC. ERIE – Penn State Behrend freshman closer Chad Zurat of Clearfield got out of one jam but couldn’t escape a second against LaRoche and suffered his first loss in three decisions Saturday. The visiting Redhawks had rallied to tie the pivotal Allegheny Mountain Collegiate Conference game 4-4 and had the bases loaded and two outs when Zurat relieved in the fifth inning. He induce a groundout and, after the Lions had regained the lead at 6-4, breezed through a 1-2-3 sixth before running into trouble in the seventh. Two singles around a miscue filled the sacks with one out, and three singles produced four runs for an 8-6 win that lifted LaRoche into first place at 10-3. Penn State Behrend (17-9) fell into third place at 9-4, a half game behind Penn State Altoona (9-3), and was unable to gain ground when the nightcap, tied at 2-2, was suspended after four innings because of rain and lightning. Sophomore Mike Moyer of Clearfield was on the mound for the Lions in his fifth start of the season. Not counting the stats for that unofficial game, Moyer is 3-1 with a 2.15 earned run average for 37.2 innings. The right-hander has given up 25 hits and 12 runs, nine earned. He has struck out 28 and walked nine. Zurat has appeared in seven games, working 9.2 innings with 16 strikeouts and only one walk, He’s allowed eight hits and five runs, two earned for a 1.86 ERA. Senior first baseman Kyle Kline of Clearfield pinch-hit and played first base in Penn State Behrend’s 12-1 loss at Fredonia (N.Y.) Thursday. He has a .154 average with five runs batted in for 26 at-bats in 14 games. WILLIAMSPORT – Sophomore Holly Lansberry of Curwensville picked up both wins in Lycoming’s Commonwealth Conference sweep of Alvernia at the Shangraw Athletic Complex Friday and was 3-2 in the circle for the week. In the opener, Lansberry was unable to save the win for Bri Braga after relieving in the fifth inning, but her teammates bailed her out by rallying for three runs in the bottom of the seventh for an 8-7 victory. Lansberry worked 2-2/3 innings and gave up four hits, two walks and five runs, though only two were earned. She started for the 14th time in the nightcap and departed after Alvernia closed to within 11-9 in the sixth inning. Braga came on to save Lansberry’s ninth win in 15 decisions. Lansberry’s other victory was a big one Thursday. She scattered seven hits against Messiah, ranked No. 7 in NCAA Division III, as the Lady Warriors halted a nine-game losing streak with a 3-2 victory that was hailed as one of the biggest upsets in school history. The loss was only the fifth in 30 games for the conference co-leaders. Lycoming (12-14) sits in fourth place at 6-6, a school record for conference wins. An unearned run on a two-out error in the sixth inning spoiled Lansberry’s strong outing against Misericordia in the first of the week’s four double-headers for the Lady Warriors. She pitched a five hitter with seven strikeouts in the 1-0 loss in the non-conference game. The following day, host Arcadia roughed up Lansberry for nine hits and nine runs in 4-2/3 innings of a 10-2 win. When not pitching, Lansberry got starts as the designated hitter in three games and the left fielder in one, finished the week with five hits and six runs scored as the leadoff batter in every game. Her batting average slipped to .315, still fourth highest on the team. She has 23 hits, with one double and one triple, and eight runs batted in. Lansberry is third in the conference in both innings pitched (96-1/3) and strikeouts (83) and tied for third in wins. In 18 appearances, she’s given up 100 hits and 68 runs, 49 earned. She has issued 39 walks. CALIFORNIA – Senior first baseman Brittany Pataky of Clearfield had two hits in the three games Lock Haven played in the Pennsylvania State Athletic Conference Tournament First Round pod at Lilly Field last week. The Lady Eagles, the Central Division’s No. 2 seed, were nipped 6-5 by Eastern Division No. 3 seed West Chester in their opener Thursday but bounced back to knock off No. 20-ranked and Western Division champion California 7-4. In Friday’s rematch with a berth in this week’s PSAC Championships at stake, West Chester (33-17) broke a 4-4 tie with eight runs in the top of the seventh inning and outlasted Lock Haven 12-7 to join Indiana and Kutztown in the finals. Lock Haven will finish 25-12 unless it receives a bid to the eight-team NCAA Division II Atlantic Regional Tournament. California was No. 4, Lock Haven No. 7 and West Chester No. 8 in last week’s rankings. Pataky sports a team-high .371 batting average for 105 official at-bats. She has 39 hits, including six doubles, two triples and one home run. Pataky is the leader in sacrifice bunts (10), times hit by a pitch (2) and fewest strikeouts (8) and tied for first in triples. She is second in hits and sacrifice flies (2), tied for second in runs batted in (25) and tied for third in walks (13). Her fielding average is .994, with only two errors in 355 chances. NEW WILMINGTON – Penn State Behrend senior Michael Johnson of Clearfield returned to Harold Burry Stadium for the three-team Westminster Mini-Meet Friday and notched his second high jump win there in six days. Johnson, coming off a victory at the 11-team Westminster Invitational, cleared 1.85 meters (6 feet, 3/4 inch), matching his career record. He also ran the first leg for the Lion ‘B’ 4×400-meter relay team that placed third in 3:36.08.